Vitamin D is one of the oldest hormones (>500 million years). The Phytoplankton species that existed in the Sargasso Sea was found to contain a large amount of ergosterol (Vitamin D2 precursor). Vitamin D gained essential role (to maintain a rigid skeleton in calcium poor environment) in higher terrestrial animals to cope with higher gravity. The 7-DHC-7-dehydrocholesterol (pro vitamin D3-in lipid bilayer of the epidermis) is converted pre- vitamin D3 on exposure to sunlight ultraviolet B (UV-B wavelengths 290–315 nm). This pre- vitamin D3 undergoes conformational changes in the lipid bilayer of the skin to convert into vitamin D3(cholecalciferol) at body temperature and is ejected from the plasma membrane into extracellular space. The liver converts vitamin D3 into 25 hydroxy vitamin D3(25[OH]D3). While Vitamin D is the major storage form, 25(OH)D3 is the major circulating form of vitamin D. 1,25 di-hydroxy vitamin D3 is (1,25[OH]2D3) is synthesised by kidneys and other tissues. On excessive exposure to sunlight, pre vitamin D3 is converted to biologically inert products (lumisterol and tachysterol). Vitamin D2 is derived from plant sources. Most vitamin D2 comes from yeast and mushrooms exposed to sunlight and UV radiation. Parathyroid hormone (PTH) converts 25(OH)D3 to 1,25(OH)2D3 which helps in calcium absorption from the gut. PTH is secreted when the serum calcium falls below the normal range, which resorbs the bone to maintain the serum calcium to normal (secondary hyperparathyroidism [SHPT]). PTH also increases the tubular reabsorption of calcium in the kidneys and to increase the renal production of 1,25 di-hydroxy vitamin D3. 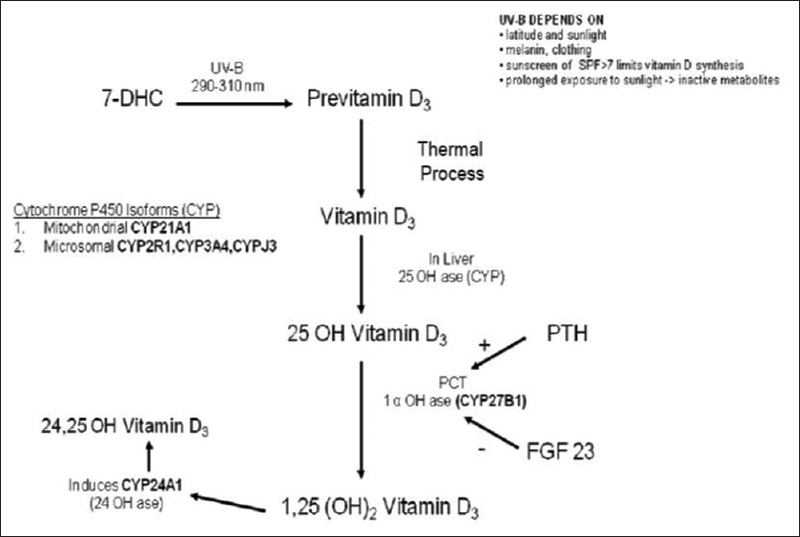 Thus, the 'Ca-vitamin D-PTH endocrine axis' is orchestrated by Vitamin D [Figure 1]. 1,25 dihydroxy vitamin D3 acts through genomes (genomic actions) and chemical messengers (Rapid responses-RR) [Figure 2] genomic action take a few hours to days. The Vitamin D receptor (VDR) interacts with retinoid X receptor (RXR) to form 1,25(OH) D-RXR-VDR complex which further interacts with DNA sequences and Vitamin D-responsive elements. 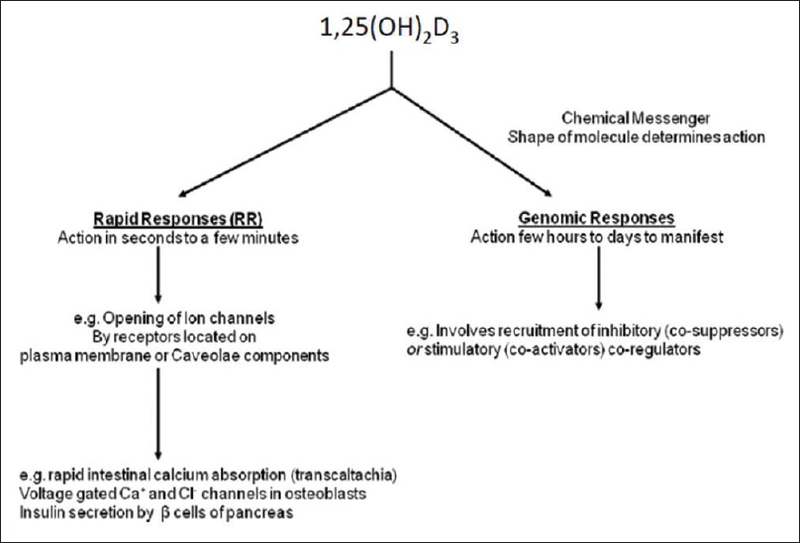 The RR include the opening of ion channels which occurs in few seconds to as long as 10–60 min (e.g., intestinal absorption of calcium-transcaltachia), secretion of insulin by pancreatic β-cells, the opening of voltage-gated Ca++ and Cl− channels of osteoblasts, etc.). While the non-calcaemic benefits are becoming to be understood, calcaemia benefits are well established. The peak bone mass (bone density) at the end of the growth period is attained with adequate vitamin D and calcium intake.,, An increase in dietary calcium intake during infancy, childhood and adolescence favours bone mineral accrual. To attain bone growth potential, adequate nutrition and sufficient physical activity provide the necessary mechanical impetus. Vitamin D and calcium status correlate with bone density. They have the potential to increase the peak bone mass and effectively prevent osteoporosis at late age. The ability of the skin to synthesise vitamin D is affected by: Environmental factors such as latitude, season, day and night, time of the day, the solar zenith angle (SZA), amount of cloud, ozone and aerosols, atmospheric pollution, UV index and Personal factors such as, dress code, skin pigmentation (Indians come under the skin category-type V), age (reduced ability of skin capacity with age), minimal erythemal dose (MED) and application of sun protection factor. The SZA becomes more oblique in winter and few UVB photons penetrate earth surface., The SZA is also more oblique in the early morning and afternoon which is why even in India very little if any vitamin D is produced in the skin before 10 a.m. and after 3 p.m.
Calcium and 1.25 dihydroxy vitamin D3 are closely linked in their action at the cellular level. Adequate dietary calcium is necessary for bone mineral accrual. Compared to the recommended daily/dietary allowances (RDA) of the Indian Council of Medical Research (ICMR), there is a high prevalence of inadequate dietary calcium intake across rural, urban and metro population. The average (mean ± standard deviation) dietary calcium intake in India is 560 ± 310 mg/day in adults and 430 ± 180 mg/day in children.,,, The dietary calcium intake of rural, urban and metropolitan city subjects in India (mean ± standard error of mean) is 269 ± 2; 308 ± 2.3; and 526 ± 8 mg/day, respectively (P < 0.001) which is lower than ICMR recommendations, [Table 1]. The phytate content of the diet is high and is significantly different in the rural, urban as well as the metropolitan city groups (P < 0.0001).,,, Phytates retard/prevent the absorption of calcium from the gut. Vitamin D deficiency affects the calcium, phosphorous and bone metabolism. With Vitamin D deficiency there is decreased efficiency of intestinal absorption of calcium and phosphorous from the diet resulting in elevated PTH levels.,,, The SHPT thus ensued, maintains the serum calcium in the normal range, mobilising the calcium from the skeleton and increasing phosphate excretion from the kidneys. The PTH-mediated osteoclastic activity weakens the bone leading to decreased bone mineral density (BMD) resulting in osteopenia and osteoporosis. The phosphaturia due to SPHT causes low normal or low-serum phosphorus levels. The result is inadequate calcium phosphorous product causing mineralisation defect. Modernisation with prolonged indoor working hours, sun-shy nature of Indians, traditional clothing habits ('burqa' and 'pardah' further reduce skin exposure to sunlight in women), darker pigmentation, high atmospheric pollution, phytates in high-fibre diet, low dietary calcium intake, repeated, unplanned and unspaced pregnancies (decreased maternal stores of vitamin D) are the factors responsible. Sources of vitamin D: Sunlight-UVB radiation, Cod liver oil, salmon fish, Mackerel, Sardines, Tuna, Egg yolk, Mushrooms (if exposed to sunlight or UV radiation). Sources of calcium: milk and milk products (120–210 mg/100 g edible portion)– buffalo's and cow's milk– curd; about 790–1370 mg/100 g edible portion in cheese, paneer, khoa, skimmed milk; Cereals and Legumes (200–340 mg/100 g edible portion)-Ragi, whole bengal and horse gram, rajmah and soya bean; green leafy vegetables (500–800 mg/100 g edible portion)– Amaranth, cauliflower greens, curry leaves, knol-khol leaves; Nuts and oil seeds-coconut dry, almonds, hazelnuts, mustard, sunflower (130–490 mg/100 g edible portion), gingelly and cumin seeds (1080–1450 mg/100 g edible portion). Serum 25OHD levels (half-life 3 weeks), is an established proxy of the vitamin D status of an individual. The concentrations of 25(OH)D in the serum reflect both absorption and cutaneous synthesis. The commercial immunoassays quantify total 25(OH)D which includes the exogenous and endogenous Vitamin D. Hence, the terminology '25(OH)D' is preferred. Unfortunately, most commercial kit assays cannot adequately measure 25-hydroxy vitamin D2. Now that India is fortifying food with vitamin D2 this will be a major issue in the assessment of Vitamin D status of an individual. Assessment of active form 1,25(OH)2D3(half-life 4–6 h) is not used to estimate the vitamin D status of an individual except in conditions such as acquired and inherited disorders of vitamin D and phosphate metabolism. Metabolic bone diseases– Rickets, osteomalacia, osteoporosis, older adults with history of falls/or non-traumatic fractures; pregnant and lactating women; Chronic hepatic and renal failure; Pancreatic diseases– cystic fibrosis, calcific pancreatitis; post-whipple procedure; Disorders of gut– Inflammatory bowel diseases, Crohn's disease, malabsorption syndromes, radiation enteritis; post-bariatric surgery; hyperparathyroidism; granulomatous disorders– tuberculosis; sarcoid; fungal diseases– histoplasmosis, coccidiomycosis, some lymphomas and those on medications– anti-seizure medications; glucocorticoids; antifungals and cholestyramine. The RDA of calcium (mg/day) (both genders) for Infants 0–1 year 500, children 1–9 years 600; for children 10–18 years 800; for adults is 600; and for pregnant and lactating women 1200 as per the revised guidelines of ICMR [Table 1]. The committee was of the view that Vitamin D fortification and supplementation pertain to the population in developed countries where there is limited sunlight exposure. The committee felt that outdoor physical activity was not only a means of achieving adequate synthesis of Vitamin D but also helps in controlling overweight and obesity. The previous recommendation of 400 IU/day for adults was retained. SPHT occurs when the 25(OH)D levels are <20 ng/dl. SPHT leashes the bone, conserves calcium from the kidneys and converts 25(OH)D to 1,25(OH)2D and helps in calcium absorption from gut to maintain serum calcium level to normal. Hence, vitamin D and calcium supplementation therapy are to suppress SPHT and help in bone accretion. When the vitamin D status is low only 10%–15% of dietary calcium and 60% of phosphorous is absorbed. Vitamin D sufficiency enhances the calcium absorption by 30%–40% and phosphorous absorption by 80%. Cholecalciferol is the drug recommended for the general population, the population at risk and treatment of vitamin D deficiency. Vitamin D2 should also be included for pharmacological preparations since vegetarians will not take vitamin D3. The blood level increase in 25-hydroxy vitamin D depends on the baseline blood level in response to Vitamin D. There is a robust increase in 25-hydroxy vitamin D levels with small amounts of Vitamin D when blood levels of 25-hydroxy vitamin D are <20 ng/mL. Thereafter for every 100 IUs suggested the blood levels of 25-hydroxy vitamin D increase by 0.6–1 ng/mL. Analogues such as 1α-(OH)D3, 1α-(OH)D2, 1,25(OH)2D3, 19-nor-1α,25(OH)2D2, 22-oxa-1α, 25(OH)2D3, 25(OH)2D3, should not be used to manage Vitamin D deficiency. They are used in the chronic renal disease when associated with disorders of Vitamin D hydroxylation. Calcium carbonate and citrate are the most common forms of calcium preparation. Calcium carbonate is given immediately after a meal to ensure optimal absorption (1250 mg of calcium carbonate gives 500 mg of elemental calcium, which is the maximal dose of calcium given at a time). Calcium citrate can be taken without meals and is the supplement of choice in a patient with achlorhydria and those taking proton pump blockers and histamine-2 blockers. Calcium from calcium citrate is slightly better absorbed than calcium from calcium carbonate. Calcium carbonate is the least expensive and is what often is recommended. It should be taken with a meal if at all possible. Studies by Recker have shown that calcium carbonate is perfectly absorbed in achlorhydric patients as long as it is taken with a meal. It is not absorbed on an empty stomach if the calcium carbonate is in some type of pill form. Calcium gluconate and lactate are less concentrated form of calcium and are not practical for supplementation in oral form. The upper tolerable (UL) limit for calcium is 2500 mg/day. Vitamin D is absorbed into the lymphatic system through chylomicrons. Vitamin D metabolite 1,25(OH)2D3 uses VDR to regulate intestinal calcium absorption. Four models of vitamin-D-regulated intestinal calcium absorption are proposed, namely, facilitated diffusion, vesicular trafficking, transcaltachia and regulated paracellular transport. The candidate at risk for vitamin D deficiency is those mentioned under the section-screening. In these individuals' supplementation is to be implemented to maintain the serum 25(OH)D concentration >30 ng/mL. For both genders, the daily vitamin D requirements (IU/day) for infants and children 0–1 year require 400 IU; 1–18 years 600 IU. To raise the serum 25(OH)D concentrations consistently >30 ng/ml may require 1000 IU/day. For age 19–70 years require 600 IU/day. To maintain serum concentrations consistently >30 ng/ml may require 1500–2000 IU/day. Adults 70 years and above require 600–800 IU/day and at least 1500–2000 IU/day to raise the 25(OH) D levels >30 ng/ml consistently. In pregnancy and lactation at least 600 IU/day of vitamin D is required. 1500–2000 IU/day may be required to maintain blood levels of 25(OH)D above consistently 30 ng/mL. Night workers and dark-skinned adults require 1000–2000 IU/day throughout the whole year. Obese individuals require 2–3 times the dose required for age-matched peers with normal body weight. The tolerable upper intake level (both genders) for infants 0–12 months is 2000 IU; children 1–18 years 4000 IU; adults 19–70 years 10,000 IU; and pregnancy and lactation 10,000 IU. The therapeutic dose of vitamin D should be supplemented and treatment carried out until the 25(OH)D concentrations of >30 ng/mL is reached. The dose 0–1 year of age is 2000 IU/day; 1–18 years 4000 IU/day; adults (19–70 years) and elderly (>70 years) 10,000 IU/day. Alternatively, adults and elderly can be given 60,000 IU/weekly for 8 weeks to achieve 25(OH)D concentrations of >30 ng/mL and followed by maintenance dose for their respective age. In patients with skeletal symptoms, it is necessary to assess and monitor a parameter of calcium and phosphate metabolism (serum calcium, phosphorous, alkaline phosphatase, PTH and calcium/creatinine ratio). Verify if the patient was already on appropriate vitamin D supplementation schedule the regularity of dose, intake, type of preparation and way of supply. If appropriate, increase the dose by 50% and reassess after 6 months. If vitamin D was not supplemented previously, consider starting vitamin D intake as recommended for the general population. When the patient is on optimal vitamin D levels and on supplementation, it is advisable to continue the previous management. In those not on supplementation to consider starting Vitamin D intake as recommended for the general population. “Stossen” (German) means to push. Stoss therapy involves pushing large doses of cholecalciferol to treat nutritional rickets. The basis of this therapeutic approach is that adipose tissue and muscles efficiently store cholecalciferol after a single large dose. There is continued conversion into active metabolite 1,25(OH)2D3 to heal rickets. In a country like India, with limited resources, compliance and cost are the major advantages of single-dose intramuscular stoss therapy over daily, weekly regimes or oral stoss therapy. Cholecalciferol 600,000 IU deep intramuscular (for >18 years age) would maintain serum levels adequately and supress PTH. The second dose should not be repeated until the next 8 weeks. Stoss therapy should be followed by maintenance dose of vitamin D and adequate dietary calcium intake. Calcitriol is not used for stoss therapy. In India, most supplementation schedules in adults for correcting vitamin D deficiency have shown that with a dosage of cholecalciferol 60,000 IU/weekly for 8 weeks (with or without calcium supplementation) have achieved normal serum levels of 25(OH)D at the end 2 months.,, When the supplementation is not followed by maintenance schedule the serum 25(OH)D levels drift back. Hence, they need to be followed up with cholecalciferol 60,000 IU/once a month. In a study conducted in India,, vitamin D supplementation (based on the Endocrine Society Clinical Practice Guidelines), even up to UL intake levels along with elemental calcium of 1 g/day is safe and does not lead to hypercalcaemia. In another study conducted in India, parental dose of 600,000 IU of cholecalciferol/deep IM stat followed by maintenance cholecalciferol therapy was compared with cholecalciferol 60,000 IU/weekly for 8 weeks followed by maintenance cholecalciferol therapy. Both groups received elemental calcium throughout. Both groups achieved similar serum calcium, 25 OH D levels and suppression of PTH. Parenteral dose of 600,000 IU of cholecalciferol/deep IM stat SHOULD NOT be repeated until the 8th week. After 8 weeks, oral cholecalciferol 60,000 IU/once a month can be given. Loading doses of cholecalciferol (oral or parenteral) are not reccomended in pregnant women unless the patient has symptomatic vitamin D deficiency (tetany or symptomatic hypocalcaemia). Daily requirement of cholecalciferol in pregnancy is 2000 IU/day. The UL limit of cholecalciferol supplementation is 10,000 IU/day. Thus, a simple supplemental dose without adequate loading doses may not be sufficient to achieve therapeutic levels. Similarly, after a loading dose, if not sustained in the long term with supplemental dose may not give desired benefits. In the Indian context, Vitamin D supplementation if not accompanied by adequate calcium supplementation may not achieve desired skeletal benefits. Iron is not combined with calcium. Because of the cost of 25(OH)D estimation repeated estimation of 25(OH)D is not advised. However, repeat estimations of 25(OH)D is undertaken in at-risk patients when there is no desired response in patients treated with metabolic bone diseases. A serum calcium level of 10.5–11 mg/dL and above point to vitamin D toxicity. A baseline serum calcium helps in follow-up. Fasting urine calcium-to-creatinine ratio (calcium and creatinine measured as milligrams/dL in random urine specimens) of 0.25 and above is an indirect indicator of vitamin D excess. Once 25(OH)D concentrations of >30 ng/mL is reached, maintaining the serum levels along with adequate calcium supplementation is important. Adequate 25(OH)D levels will suppress SHPT. To calcify the osteoid formed due to vitamin D deficiency adequate calcium is important. It has been shown from bone histomorphometric studies that subjects with 25(OH)D levels <20 ng/dL have wide osteoid seams and may take anywhere from 10 to 15 years to mineralize (mineralization lag time) their bones. Hence, maintaining adequate 25(OH)D levels >30 ng/mL with adequate dietary calcium is imperative for skeletal health. Serum concentrations of 25(OH) D >150 ng/mL (375 nml/L) is considered as toxicity and levels up to 100 ng/ml (250 nmol/L) are cited as safe for both children and adults. Serum 25(OH)D concentrations are elevated associated with hypercalcaemia or hypercalciuria and suppressed PTH. Patients present with clinical features of lethargy, vomiting, polyuria, polydipsia, altered sensorium, weight loss, nausea, constipation, renal dysfunction, renal calculi, muscle weakness, hypertension, neuropsychiatric disturbances, cardiac arrhythmias and ultimately death. It is commonly due to overdosing by prescriptions or intake by patient with high doses of vitamin D doses that exceed suggested recommendations. The UL value is the highest value of vitamin D oral intake which is unlikely to produce risk of adverse effects during growth and maturation, adulthood and ageing. Two conditions to the exception of the rule are-granulomatous diseases and genetic defect or absence of 24-hydroxylase (CYP24A1). In granulomatous diseases like sarcoid, there is excess extrarenal 1-alpha-hydroxylase. This leads to excessive and uncontrolled production of calcitriol (1,25[OH]2D3) resulting in low 25(OH)D levels. In these conditions, the recommended target for serum 25(OH)D is 25 ng/mL. The active form of Vitamin D 1,25(OH)2D3 is formed by 1-alpha-hydroxylase (CYP27B1). The levels of 25(OH)D and 1,25(OH)2D3 is regulated by cleavage reaction of 24-hydroxylase (CYP27A1). This enzyme catalyses 25(OH) D and 1,25(OH)2D3 to inert metabolites. Mutations of CYP27A1 gene coding 24-hydroxylase or excessive synthesis 1,25(OH)2D3 of resulting from the mutation of SLC34A1 gene coding sodium-phosphate co-transporter (NaPi-IIA) in the kidney can result in a risk of hypervitaminosis D even in prophylactive doses of Vitamin D.
The most physiological relevant and efficient way of acquiring vitamin D, in locations around the equator (between latitudes 42° N and 42° S) is endogenous synthesis from the skin. A minimum of 30 min skin exposure (without sunscreen) of the arms and face to mid-day sun will be sufficient for the day requirement. Vitamin D synthesised in the skin lasts twice as longer in the body compared to ingested/supplemented dose. Exposure of body in bathing suit (almost 100% of body surface area) to sunlight causes slight pinkness (1 MED) is equivalent to ingesting approximately 20,000 IU of vitamin D orally. Applying the rule of nines Burns chart, exposure of both forearms and face is equivalent to exposing 12% of body surface area. Exposure of 1 MED two to three times a week can meet the body's requirement of Vitamin D (Holick's Rule). '1 Standard vitamin D Dose' (SDD) is the time required to obtain recommended UV dose for adequate vitamin D synthesis. For Asians with skin type V, 1 SDD at 11.5° N is 10–15 min, and at 29° N is 10–45 min at solar noon, with longer durations in winter. Vitamin D synthesis can be reduced and force 'Vitamin D winter' when there are clouds, aerosols and dense ozone. India is located at between 8.4° and 37.6°N. A study conducted from Tirupati (latitude 13.4° N and longitude 77.2° E, south India) using 'in vitro' ampoule model with precursors of vitamin D (7-dehydrocholesterol), when exposed to sunlight, converted to active Vitamin D best in mid-day sun (between 11 a.m. to 2 p.m). From the various Indian studies in the literature, there is a strong inverse correlation between the 25(OH)D levels and latitude (r = −0.48; P < 0.0001). The 25(OH)D levels in South Indian subjects are relatively higher than in subjects in North India clearly establishing the relationship between closeness to the equator (smaller zenith angle) and natural Vitamin D synthesis. In another study, authors assessed serum 25(OH)D and bioavailable 25(OH)D in males with varying durations of sun-exposure between indoor and outdoor environments in Delhi (latitude 28.38° N and longitude 77.12° E) during August–September. They demonstrated that outdoor workers with prolonged sun-exposure were vitamin D-sufficient, with higher serum bioavailable 25(OH)D than the indoor workers during summer. Studies from Pune (latitude 18.31° N and longitude 73.55° E) have shown that toddlers exposed to sunlight (playing outside) for more than 30 min-a-day exposing more than 40% of their body surface area have a normal Vitamin D status which was three times more compared with the toddlers who were indoors for most part of the day. Hence, the association between Sunlight exposure and vitamin D synthesis is well established in South Asians. We as human can get vitamin D from abundant sunshine. The position statement for vitamin D and health in adults in Australia and New Zealand recommends a walk for 6-7 mins mid-morning or mid afternoon in summer and as much bare skin exposed as feasible for 7-40 mins at noon in winter, for fair-skinned people on most days to maintain adequate vitamin D levels in the body. India has the unique burden of 'twin nutrient deficiency'– vitamin D and calcium. Any public health measures which address the problem in isolation may not have the desired skeletal benefits in the long term. Recently, in India, milk and cooking oil is being fortified with vitamin D. There are many reports,,,,, and proposal for fortification process. India has 1.33 billion population with a rural-urban distribution: 68.84% and 31.16%. There has been a spurt in growth of population in Urban areas in the country, which could be due to: migration, natural increase and inclusion of new areas under 'urban' in the census. Majority of rural population sell their produce (milk, vegetables, grains, etc.,) to the urban for their lively hood., Only 35% of the Indian populations have access to regulated milk supply. India ranks 97 among the 118 developed countries in Global Hunger Index. Any fortification measure should reach the population as a whole. Majority of the population in rural areas do not have accesses to organised food supply chain (dairy and nondairy products) in India, especially the rural and semi-urban areas. However, they do have a better opportunity to sun exposure. In a study form Delhi slums, it was shown that toddlers who were exposed to sunlight had better vitamin D status (~100 nmol/L) than those who were not (~20 nmol/L). The families whose toddlers were exposed to the sun were given educational material by local healthcare workers explaining the benefits of sunshine. Food fortification process needs to be initiated with an aim to improve distribution through organised sector with good surveillance. Increasing efforts to mobilise available resources that would improve knowledge and education about the benefits of sun exposure for 30 min, by exposing 12%–18% of body area for 30–45 min a day without sunscreen along with enhancing the dietary calcium intake would go a long way much before the food fortification program become a reality. Pragmatically, in those areas with abundant sunshine, school teachers should educate their students to expose them to sunlight during lunch hour (sunshine hour). Toddler, children, elderly adults should be encouraged to expose to mid say sun. Working classes can be encouraged to take a walk in the sun post-lunch. Such an approach with equal emphasis on knowledge on dietary calcium and importance of sunlight exposure will go a long way in improving the current status. While the majority of the urban resident who have limited to sun exposure must supplement with vitamin D and calcium and should have food fortified in vitamin D and calcium to meet their daily requirements. The major source of vitamin D for both children and adults is unprotected sun exposure. In the absence of sun exposure, adequate amount of Vitamin D from dietary sources and supplementation is a must to satisfy body's requirement. In India, an adequate amount of Vitamin D should be accompanied by dietary/supplemental calcium to achieve desired skeletal benefits. Chen TC. Photobiology of Vitamin D. In: Holick MF, editor. Vitamin D Physiology, Molecular Biology, and Clinical Applications. New Jersey: Humana Press; 1998. p. 17-37. Harinarayan CV. Multiple roles of Vitamin D. NFI Bull 2014;35:1-8. Razani B, Woodman SE, Lisanti MP. Caveolae: From cell biology to animal physiology. Pharmacol Rev 2002;54:431-67. Slemenda CW, Peacock M, Hui S, Zhou L, Johnston CC. Reduced rates of skeletal remodeling are associated with increased bone mineral density during the development of peak skeletal mass. J Bone Miner Res 1997;12:676-82. Johnston CC Jr., Miller JZ, Slemenda CW, Reister TK, Hui S, Christian JC, et al. Calcium supplementation and increases in bone mineral density in children. N Engl J Med 1992;327:82-7. Jones G, Dwyer T. Bone mass in prepubertal children: Gender differences and the role of physical activity and sunlight exposure. J Clin Endocrinol Metab 1998;83:4274-9. Heaney RP. Vitamin D depletion and effective calcium absorption. J Bone Miner Res 2003;18:1342. Goswami R, Gupta N, Goswami D, Marwaha RK, Tandon N, Kochupillai N, et al. Prevalence and significance of low 25-hydroxyvitamin D concentrations in healthy subjects in Delhi. Am J Clin Nutr 2000;72:472-5. Harinarayan CV, Ramalakshmi T, Venkataprasad U. High prevalence of low dietary calcium and low Vitamin D status in healthy South Indians. Asia Pac J Clin Nutr 2004;13:359-64. Indian Council of Medical Research, Dietary Guidelines for Indians. Available from: http://www.ninindia.org/DietaryGuidelinesforNINwebsite.pdf. [Last accessed on 30 Jul 30]. Harinarayan CV, Ramalakshmi T. Patterns of dietary calcium intake in South Indian rural, urban and metropolitan city subjects. J Clin Sci Res 2015;4:143-8. RDA – Recommended Dietary Allowance of Nutritional Elements. USA. Avaialble from: http://www.nationalacademies. o r g / h m d / ~ / m e d i a / F i l e s / Re p o r t % 2 0 F i l e s / 2 0 1 0 /Dietary-Reference-Intakes-for-Calcium-and-Vitamin-D/Vitamin%20D%20and%20Calcium. [Last accesed on 2018 Jun 10]. Heaney RP. Functional indices of Vitamin D status and ramifications of Vitamin D deficiency. Am J Clin Nutr 2004;80:1706S-9S. Lips P, Hosking D, Lippuner K, Norquist JM, Wehren L, Maalouf G, et al. The prevalence of Vitamin D inadequacy amongst women with osteoporosis: An international epidemiological investigation. J Intern Med 2006;260:245-54. Gordon CM, Williams AL, Feldman HA, May J, Sinclair L, Vasquez A, et al. Treatment of hypovitaminosis D in infants and toddlers. J Clin Endocrinol Metab 2008;93:2716-21. Malabanan AO, Turner AK, Holick MF. Severe generalized bone pain and osteoporosis in a premenopausal black female: Effect of Vitamin D replacement. J Clin Densitometr 1998;1:201-4. Plotnikoff GA, Quigley JM. Prevalence of severe hypovitaminosis D in patients with persistent, nonspecific musculoskeletal pain. Mayo Clin Proc 2003;78:1463-70. Bischoff-Ferrari HA, Willett WC, Wong JB, Giovannucci E, Dietrich T, Dawson-Hughes B, et al. Fracture prevention with Vitamin D supplementation: A meta-analysis of randomized controlled trials. JAMA 2005;293:2257-64. Płudowski P, Karczmarewicz E, Bayer M, Carter G, Chlebna-Sokół D, Czech-Kowalska J, et al. Practical guidelines for the supplementation of Vitamin D and the treatment of deficits in central Europe – Recommended Vitamin D intakes in the general population and groups at risk of Vitamin D deficiency. Endokrynol Pol 2013;64:319-27. Maeda SS, Borba VZ, Camargo MB, Silva DM, Borges JL, Bandeira F, et al. 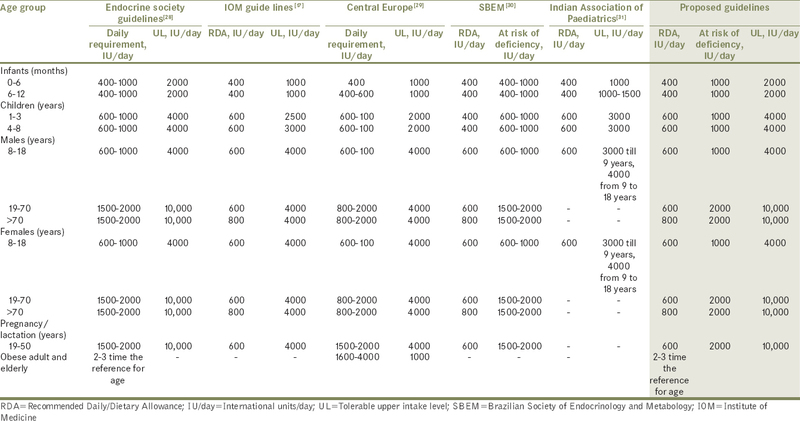 Recommendations of the Brazilian society of endocrinology and metabology (SBEM) for the diagnosis and treatment of hypovitaminosis D. Arq Bras Endocrinol Metabol 2014;58:411-33. From Indian Academy of Pediatrics 'Guideline for Vitamin D and Calcium in Children' Committee, Khadilkar A, Khadilkar V, Chinnappa J, Rathi N, Khadgawat R, et al. Prevention and treatment of Vitamin D and calcium deficiency in children and adolescents: Indian academy of pediatrics (IAP) guidelines. Indian Pediatr 2017;54:567-73. Recker RR. Calcium absorption and achlorhydria. N Engl J Med 1985;313:70-3. Chatterjee D, Swamy MK, Gupta V, Sharma V, Sharma A, Chatterjee K, et al. Safety and efficacy of stoss therapy in nutritional rickets. J Clin Res Pediatr Endocrinol 2017;9:63-9. Goswami R, Gupta N, Ray D, Singh N, Tomar N. Pattern of 25-hydroxy Vitamin D response at short (2 month) and long (1 year) interval after 8 weeks of oral supplementation with cholecalciferol in Asian Indians with chronic hypovitaminosis D. Br J Nutr 2008;100:526-9. Marwaha RK, Tandon N, Agarwal N, Puri S, Agarwal R, Singh S, et al. Impact of two regimens of Vitamin D supplementation on calcium – Vitamin D – PTH axis of schoolgirls of Delhi. Indian Pediatr 2010;47:761-9. Harinarayan CV, Appicatlaa L, Nalini A, Joshi S. Efficacy and safety of cholecalciferol supplementation in Vitamin D deficient subjects based on endocrine society clinical practice guidelines. Endocrinol Metabol Syndrome 2012;S4:4. Available from: http://www.omicsonline.org/2161-1017/2161-1017-S4-004.pdf. [Last accesed on 2018 Jun 12]. Harinarayan CV, Munigoti SP, Thennarasu K, Apicatala L, Inamdar SI. Vitamin D supplementation therapy – Efficacy of three different protocols. J Clin Sci Res 2015;4:273-80. Harinarayan CV, Kochupillai N, Madhu SV, Gupta N, Meunier PJ. Fluorotoxic metabolic bone disease: An osteo-renal syndrome caused by excess fluoride ingestion in the tropics. Bone 2006;39:907-14. Alshahrani F, Aljohani N. Vitamin D: Deficiency, sufficiency and toxicity. Nutrients 2013;5:3605-16. Tebben PJ, Milliner DS, Horst RL, Harris PC, Singh RJ, Wu Y, et al. Hypercalcemia, hypercalciuria, and elevated calcitriol concentrations with autosomal dominant transmission due to CYP24A1 mutations: Effects of ketoconazole therapy. J Clin Endocrinol Metab 2012;97:E423-7. Dinour D, Davidovits M, Aviner S, Ganon L, Michael L, Modan-Moses D, et al. Maternal and infantile hypercalcemia caused by Vitamin-D-hydroxylase mutations and Vitamin D intake. Pediatr Nephrol 2015;30:145-52. Schlingmann KP, Ruminska J, Kaufmann M, Dursun I, Patti M, Kranz B, et al. Autosomal-recessive mutations in SLC34A1 encoding sodium-phosphate cotransporter 2A cause idiopathic infantile hypercalcemia. J Am Soc Nephrol 2016;27:604-14. Engelsen O. Norwegian Institute for Air Research. Calculated Ultraviolet Exposure Levels for a Healthy Vitamin D Status; 2005. Available from: http://www.nadir.nilu.no/~olaeng/fastrt/VitD_quartMED.html. [Last accesed on 2018 Jun 12]. Webb AR, Engelsen O. Calculated ultraviolet exposure levels for a healthy Vitamin D status. Photochem Photobiol 2006;82:1697-703. Webb AR, Kline L, Holick MF. Influence of season and latitude on the cutaneous synthesis of vitamin D3: Exposure to winter sunlight in Boston and Edmonton will not promote vitamin D3 synthesis in human skin. J Clin Endocrinol Metab 1988;67:373-8. Available from: http://dx.doi.org/10.1210/jcem-67-2-373. [Last accesed on 2018 Jun 12]. Goswami R, Saha S, Sreenivas V, Singh N, Lakshmy R. Vitamin D-binding protein, Vitamin D status and serum bioavailable 25(OH)D of young Asian Indian males working in outdoor and indoor environments. J Bone Miner Metab 2017;35:177-84. Babu US, Calvo MS. Modern India and the Vitamin D dilemma: Evidence for the need of a national food fortification program. Mol Nutr Food Res 2010;54:1134-47. Ritu G, Gupta A. Fortification of foods with Vitamin D in India: Strategies targeted at children. J Am Coll Nutr 2015;34:263-72. Ritu G, Gupta A. Fortification of foods with Vitamin D in India. Nutrients 2014;6:3601-23. Kaushik R, Sachdeva B, Arora S, Kapila S, Wadhwa BK. Bioavailability of Vitamin D2 and calcium from fortified milk. Food Chem 2014;147:307-11. Khadgawat R, Marwaha RK, Garg MK, Ramot R, Oberoi AK, Sreenivas V, et al. Impact of Vitamin D fortified milk supplementation on Vitamin D status of healthy school children aged 10-14 years. Osteoporos Int 2013;24:2335-43. Tiwari L, Puliyel JM. Vitamin D level in slum children of Delhi. Indian Pediatr 2004;41:1076-7. Harinarayan C V. Vitamin D Deficiency in Sun Drenched India – Can D-lightful Sunlight Be a Respite? – Sunlight D lemma. Proc Indian Natn Sci Acad 2018;84;923-35.